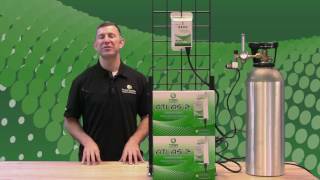 Watch Mike Gardner explain the features and benefits of the Atlas 2 CO2 Controller from Titan Controls! To protect your controller, it is important to disconnect and cover the Atlas 2 by wrapping with a plastic bag OR remove the controller from the grow area while using sulphur vaporizers in your grow room. Titan Controls can analyze and detect CO2 components that have been contaminated and damaged by sulphur vaporization. We reserve the right to not repair these defective units under warranty, however we can repair and return your Atlas 2 for a fee, if you would like. How often should I calibrate my Atlas 2? Your Atlas 2 comes to you fully calibrated from the factory. There should be no need to calibrate your Atlas 2 for about 3 years or so. The sensor 'drifts' over time and this can affect the calibration of the device. To calibrate the Altas 2, simply take it to an open area free of CO2 sources (people, barbecues, animals, vehicles, etc.) and turn the Atlas 2 "ON". Then, using a non-metalic item (like a toothpick), push the recessed 'CALIBRATION' button on the top left hand corner of the Atlas 2. The LED's will bounce back and forth on the display until the CALIBRATION process is complete. Now, place your Atlas 2 back into your grow area and it will function great for the next 3 years! Remember, you exhale 40,000 ppm of carbon dioxide with every breath you take, so DON'T breath on the Atlas 2 when it's in the calibration mode. We hear this question a lot. The main issue is the 40,000 ppm of CO2 we exhale when we're breathing. If you're in your room and you see that the ppm is high, leave the area for an hour or so and turn off your CO2 source, then peek your head in and check the reading, it should be reading under 1000 ppm mattering on how well your room is sealed. After observing your Atlas 2 CO2 Monitor/Controller for awhile, you'll start to see what your normal ppm level is in your room. The normal outdoor ppm is 400 ppm to 600 ppm based on where you live (city vs. rural). Should I run my CO2 at night? I want to move my CO2 equipment farther away from my Atlas 2 controller. Any suggestions? The easiest way to get some distance between your CO2 gear and your Atlas 2 controller is to use an extension cord. First, verify that it can handle the amperage of your CO2 gear and second, try not to go much farther then 50 feet between your gear and controller. How do I test my Atlas 2 to see if it's functioning correctly? The easiest way to test your Atlas 2 is to take it outside, away from people, animals, barbecues, vehicles, etc. Then insert a test light, nightlight, fan etc. into the piggyback plug set. Next plug it into a 120 Volt power source. Blow into the Atlas 2 and the green LED's will begin to light up showing 1000, then 1250, then 1500, then 2500 ppm respectively. Again, you exhale 40,000 ppm with every breath so you don't have to blow very hard into the Atlas 2 to get it to light all LED's. Next, allow the Atlas 2 to sit and you'll notice that the 2500, then 1500, then 1250 and finally the 1000 PPM LED's will turn off. Try this a couple of times to become familiar with the way it operates! 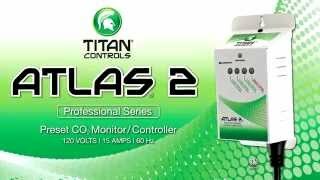 What is the current draw (in Amps) of the Atlas 2 CO2 monitor/controller? The current draw is approximately .04 Amps without a CO2 generator or CO2 regulator plugged into it.